Name a type of fruit chip that comes to your mind, chances are you can find it in Batu. There are 10 home industries producing fruit chips in the city, located some 20 kilometers to the west of Malang and about 95 kilometers from East Java's capital, Surabaya. 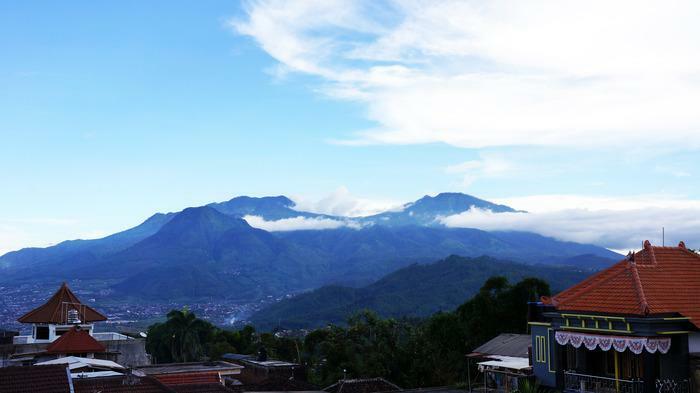 One of these is UD Putra Fajar, which is located in a two-story house in Tulungrejo village in Batu's Bumiaji district. The house is where the company's management office is located and where the chips are put into packages; its actual production factory is in another house nearby. The company's marketing manager Arochman Mustofa said that the company was started in 2009 and, at first, it did not produce its own fruit chips. “At first, the company's owner, Pak Suwardi Wiryo, bought the chips from local producers and packaged them under his own brand. It was only after he saw the abundance of fruits available that he decided to produce his own chips,” Arochman told The Jakarta Post Travel recently. Suwardi still owns the business today. UD Putra Fajar produces many types of delicious fruit chips, including those made of apple, jackfruit, snake fruit, persimmon, mango, pineapple, star fruit, melon and rambutan. Some of the fruit, such as the apple, is harvested from Suwardi's personal garden. Others, including the persimmon, snake fruit, and jackfruit, are bought from other farmers in the region and in other provinces. The jackfruit, for example, comes from Semarang. The availability of the chips is usually based on customer demand at certain periods of the year. Apple and jackfruit chips, for instance, are made in abundance during school holidays, during which the two snacks are highly popular. 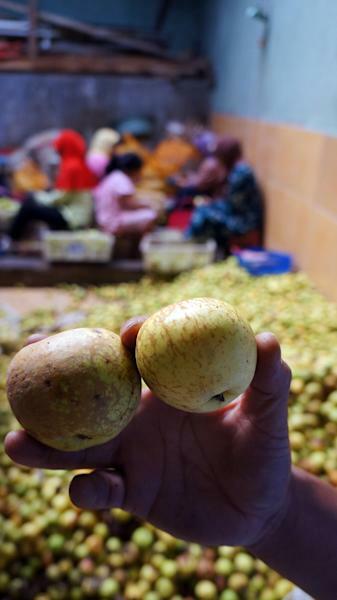 Because Batu is popular as Indonesia's “Apple Town”, the fruit is by default the star of the factory. Using Batu's local variety called the Manalagi, the production of the apple chips starts with the fruit being sorted and divided into several groups according to quality. The apples are then peeled and sliced into pieces of between three and five millimeters thick. Next, the apples are washed in fresh water for about an hour and frozen for 24 hours. The frozen apple slices will then be fried at 85 degrees Celsius in a vacuum fryer for about two hours. The factory owns three such fryers with capacities of between 50 kilograms and 100 kilograms. Afterward, the fried chips will be dried at room temperature for 10 to 15 minutes before they are ready for sale. The entire process will yield one kilogram of chips out of eight kilograms of apples. The chips can last for eight months when packaged in plastic bags and for one year in aluminum foil wrappers. A kilogram of the chips sells for between Rp 70,000 (US$7) and Rp 90,000. The production process can be slightly different for other fruits. Pineapple and star fruit, for example, need no freezing. One thing for sure is that all the chips are made entirely from fresh fruit. No sweetener, preservatives or other ingredients are added. “By producing the chips, the local farmers can still use fruit [that may seem to be unprofitable], such as those that have fallen from the trees and those with blotched exteriors, and make a profit out of them,” Arochman said. He added that about 60 percent of Batu's 190,000-strong population are apple farmers. UD Putra Jaya itself employs some 30 workers, most of whom are women, from the surrounding neighborhood. According to Arochman, most of the company's clients are local people and travelers coming to Batu, although it also receives orders from customers in other cities. “Six months ago we even received an order for 500 kilograms of apple chips from a customer in Malaysia. Unfortunately, we couldn't send the chips due to problems with customs,” he said. UD Putra Jaya also opens their gardens for travelers who wish for a cheap alternative to seeing apple trees in the Malang area. With entry fees starting from Rp 15,000 per person, visitors can eat apples to their hearts’ content. They can also buy the fruit for between Rp 10,000 and Rp 15,000 per kilogram.